Most people in the world Cady lives in have a Talent. Some are seemingly inconsequential, like a Talent for spitting, or being able to whistle well, but others are quite useful, such as Cady's Talent for baking, or Miss Mallory's Talent for matching orphans like Cady with their perfect families. In this novel, multiple voices come together to tell the story of a man desperate to find a lost piece of luggage, another man mourning the loss of his wife and child, an elderly woman victimized by a stroke who can't communicate her true identity, and Cady, who longs for the day she will bake the perfect cake for her own Adoption Day party. Using Talents as its vehicle, this book explores the unexpected interconnectedness amongst the citizens of a somewhat magical Poughkeepsie, New York. 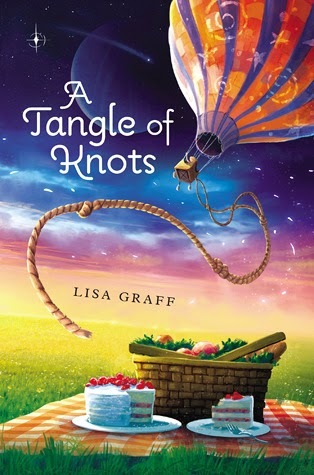 Each character experiences a mixture of hope and sadness throughout the book, as the tangle of knots that is their lives slowly unwinds, comes undone, and falls into place. There are a lot of characters, which can be overwhelming, and there are wasted pages devoted to recipes readers are unlikely to bother reading, let alone baking, but there is something compelling about the writing style that overshadows these minor problems. There is a timelessness to the story, which seems to exist in a vacuum away from cell phones, video games, iPads, and Apple watches, and away from the pettiness of catty girls, middle school love triangles, and other tired middle grade cliches. Because of the meaningful issues it explores, and the uplifting, happy ending, it is a book even the most conservative of parents (read: me) will happily allow a child to read without reservations. Next summer (2016), Lisa Graff will publish a companion to this book, A Clatter of Jars. In the meantime, readers who enjoyed this book and want more might be interested in the Quirks series by Erin Soderberg and Savvy by Ingrid Law.